The Marjory Stoneman Douglas High School massacre a year ago renewed the national debate on guns and school safety, turned some victims' parents and surviving students into political activists and at least temporarily ended the local sheriff's career. At Marjory Stoneman Douglas High School: Thursday was "A Day of Service and Love" at Marjory Stoneman Douglas; the school was open from 7:40 a.m. to noon. Therapy dogs and mental health staff were on campus. The entire Broward County school district observed a moment of silence at 10:17 a.m. on Thursday; Hundreds of thousands of students and adults across Florida and beyond participated. President Donald Trump says he and first lady Melania Trump are praying for those affected by the school shooting in Parkland, Florida, that left 17 people dead one year ago Thursday. PARKLAND, Fla. (AP) — The Marjory Stoneman Douglas High School massacre a year ago renewed the national debate on guns and school safety, turned some victims' parents and surviving students into political activists and at least temporarily ended the local sheriff's career. But Thursday's anniversary will primarily be about remembering the 14 students and three staff members who died in the third high-profile mass shooting in Florida since 2016. An interfaith service was held at a Parkland park, near the school, to remember the victims. 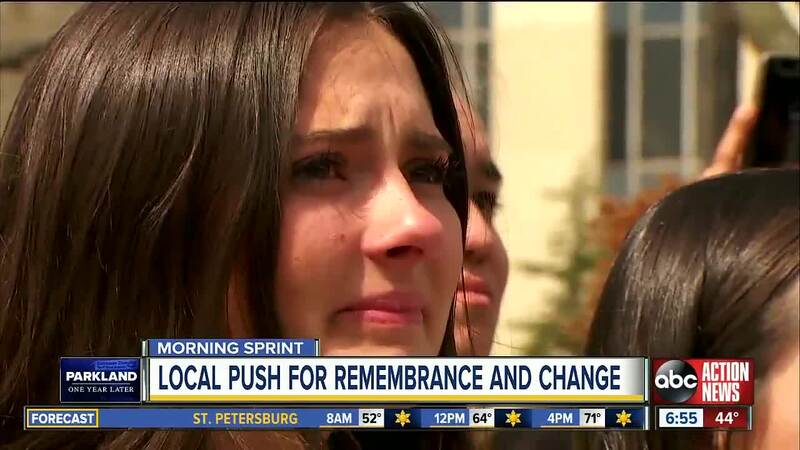 Students also performed service projects and observed a moment of silence and a non-denominational, temporary temple opened in neighboring Coral Springs for people to pay their respects. The structure will eventually be burned in a purification ceremony. Security throughout the community and at schools will be high. Many Stoneman Douglas students arrived to the moment of silence wearing the burgundy #MSDStrong T-shirts that have become an emblem of the tragedy. Outside, clear plastic figurines of angels were erected for each of the 14 students and three staff members killed. Governor Ron DeSantis ordered the flags across the state to be flown at half-staff on Thursday and he is asking all Floridians to pause for a moment of silence at 3 p.m. 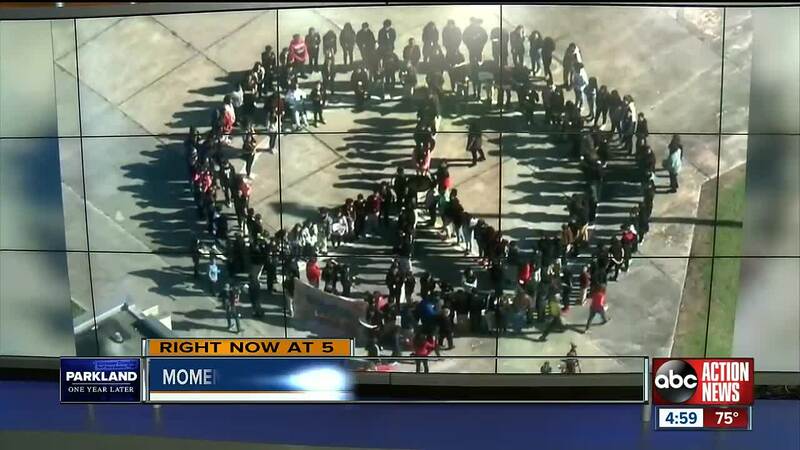 Still, many Stoneman Douglas students skipped school. For some it's too emotional; others didn't want to be in the spotlight. "When the smoke goes up and the flames go up, it will have a great meaning," said volunteer Tony Bianco, an Army veteran and artist from Coral Gables.